Lemongrass purée or powder adds a deliciously exotic lemony taste to this tender butter cookie. Beat butter and sugar with an electric mixer until creamy. Add lemon oil or extract. Gradually beat in flour, coconut and lemongrass. Stir in 1 1/2 cups white chocolate chips. 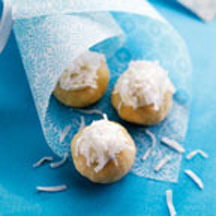 Shape dough into 1-inch balls and place 1/2 inch apart on parchment-lined baking sheets. Bake on middle rack until cookies are set and light golden brown on bottom, 10 to 12 minutes. Cool on baking sheets 2 minutes; remove to cooling racks to cool completely. Microwave remaining white chocolate chips in heavy-duty plastic bag, kneading at 10- to 15-second-intervals, until totally melted and smooth. Cut a tiny corner from bag; squeeze to drizzle over cookies. Sprinkle with additional coconut and lemongrass powder, if desired. Refrigerate cookies for about 5 minutes or until chocolate is set. Store cookies in an airtight container at room temperature for up to 1 week. Makes about 2 to 2 1/2 dozen. *Either lemongrass purée or ground powder can be used. The purée can be found in squeeze tubes in most supermarket produce sections and dry powder can be found in either the spice section or in the Asian food section of the international area.